They were hitching on the fifth day of having no transport to school and back as there is no school bus for them. It is alleged that ‘some guys from Kwanazamo township’ approached them and robbed them of their shoes. 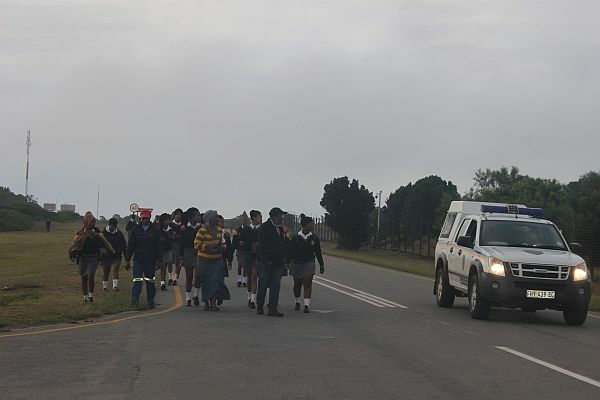 The pupils were hitching as their school bus was taken off the road by Kouga Municipality, not because it was un-roadworthy but because there was a problem with the paper work. It is the responsibility of the Department of Education to provide transport for school children if there is no high school in the town where they live. So far the department has failed to provide alternative transport since Thursday, 8 February. Kouga’s Mayor. Elza van Lingen, apparently postponed a meeting with angry parents this morning until yesterday afternoon. She told the parents she would phone the department tomorrow to sort out the paper work. According to some parents, when told of the robbery the mayor is reported to have asked the police to watch the spot tomorrow where the children hitchhike home from Humansdorp. 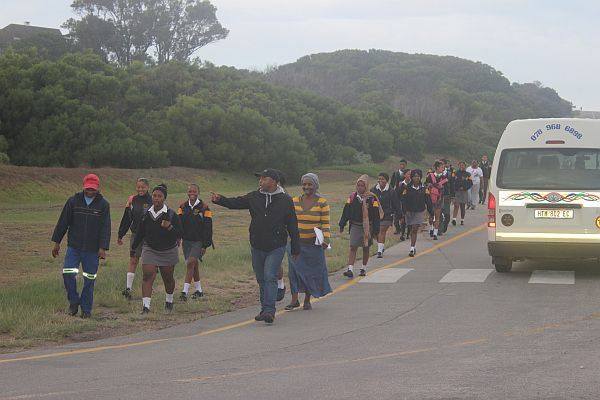 Early yesterday morning and this morning (on day 6 of ‘no bus’) several angry mothers and some fathers congregated at the stop street in Tarragona Road in the Sea Vista suburb and decided to march to the traffic circle at the entrance to St Francis Bay with some of the pupils. 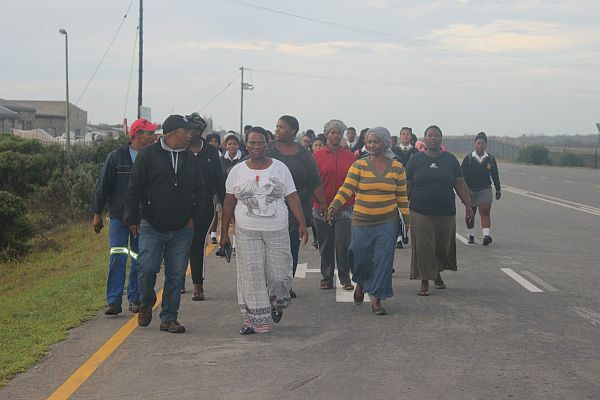 A meeting was held at the Sea Vista community hall to discuss the ‘no school bus’ situation and it was decided to meet with Kouga’s mayor at 8 am yesterday morning in the hope that she could get a bus sorted out for them by today. But no bus arrived this morning either. 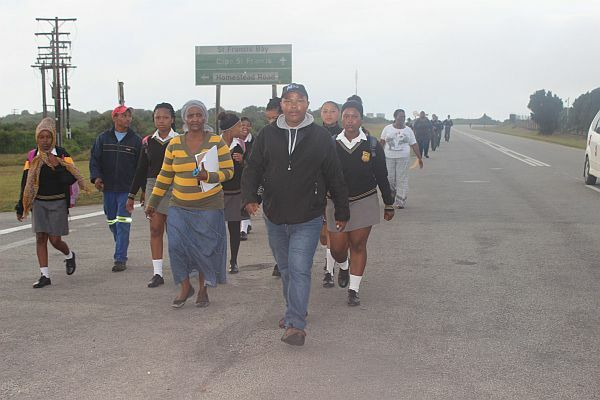 More than 200 Sea Vista school children have been hitching to Humansdorp from St Francis Bay and back the past five school days. They have to walk down the hill to the entrance of the town, hitch to Humansdorp (about 12 kms away) and then in the afternoon have to hitch back to St Francis and walk up the hill back home. They are too tired to do their homework when they eventually get home, parents have complained. 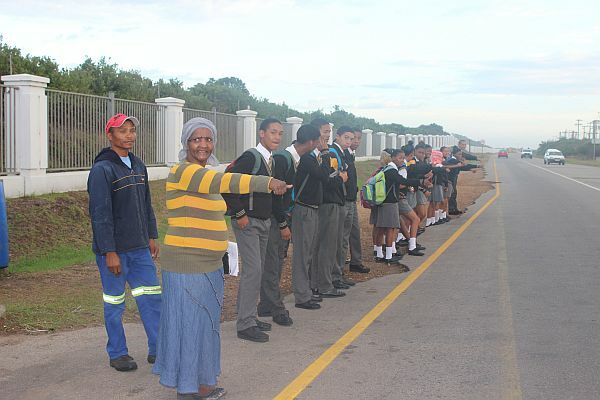 Some of the parents, mostly mothers, demonstrated their anger and concern at the traffic circle at the entrance of St Francis Bay every day, They are furious their children have to hitch to school and that no bus has yet been organised. Tomorrow, the sixth day, they say they will be ready to march again. It appears that bureaucratic ‘red tape’ regulations on the part of the Kouga Municipality and the Departments of Education and Transport has led to the ‘no transport’ situation. The bus permit and contract for allowing a bus company to transport the children to school and back has been made out in the wrong name and even though the bus is roadworthy, traffic officials won’t allow it on the road. And to add further red tape the Education and Traffic Departments are stalling or taking too long to provide another five year contract and permit in the correct name to the bus tour company. The mothers said they had had no prior warning that there would be no transport for their children. School principal, PH Pietersen, did not want to talk to the press. The secretary told me to phone the Education Department and Road Transport Department. The telephone numbers go unanswered and smses are nit responded to. According to a spokesperson for the bus company, Van Rensburg Tours, the Kouga traffic department took the bus off the road. She said the company has a bus which has been transporting the children for five years. When the contract with the Department of Education expired new forms were filled in by the company to commence a new contract with the department. The department incorrectly made up a new contract in another name. Then the tour company was unable to get a permit and the bus was pulled off the road. “Until bureaucratic officials sort out the correct paper work for the bus, children are being punished by not being able to get to school,” one motorist who stopped to give some children a lift, said.